Sennheiser has come up with the first set of quality headphones that can plug straight into your mobile phone or PDA to improve mobile music listening. 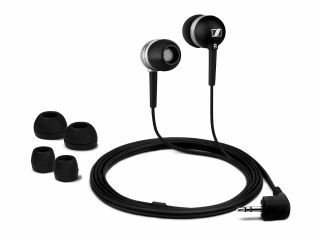 The Sennheiser CX 300 2.5mm in-ear headphones are the first quality headphone set to come with a 2.5mm jack that can fit directly into mobile phones and PDAs that have suitable sockets. Usually mobiles or PDAs with 2.5mm headphone sockets require adapters to plug in quality headphones that use standard 3.5mm jacks. The Sennheiser CX 300 2.5mm are ear-canal earphones based on technology used for in-ear stage monitors. They come with three sizes of ear adapters to get a snug fit. And they're designed to improve audio performance and cut out ambient noise. Sennheiser claims the CX 300 2.5mm earphones offer powerful bass-driven stereo sound and good audio clarity. The high efficiency earphones are also said to help prolong battery life - a plus point for mobile phone users. The Sennheiser CX 300 2.5mm earphones are available now for £39.99.